The advent calendar seemed to of been really good for it its value of money, as this product alone retails at £19 and its full size...result! 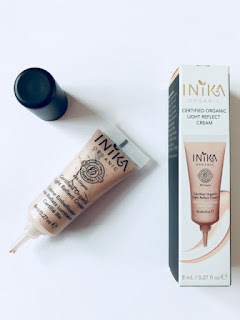 Although being full size, it is a small tube, which some reviews have said they were disappointed with the price for the size it is, BUT a little really does a go a long way! you literally need a tiny amount! I've used mine for a few weeks now and I've hardly used any up! i normally just apply mine onto my cheek bones. it gives a pretty glow! not over powering like you have two strobe lights on your cheeks bones but a nice subtle, but definitely noticeable glow! The one thing i will say about this product is that is does dry pretty quick, so as soon as you apply it to the areas you want it, blend it in straight away. I apply mine with just my fingertips but you can use a little brush to blend it in but i prefer just to dab! after revealing a lovely natural youthful glow! Have you tried any of the products? what would you recommend? on feel unique they currently have 10% off!